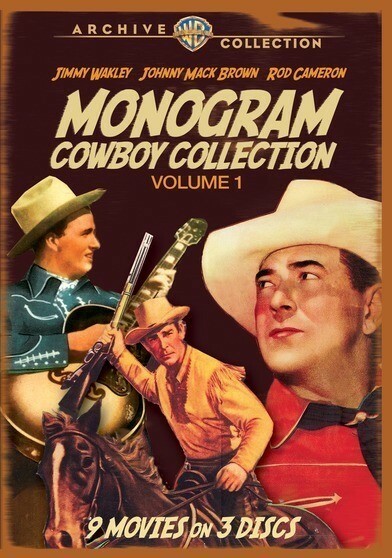 Ride back with us to the golden age of B-Movie Western matinees and saddle up with your favorite stars as they saunter back into the spotlight in this first volume of classic oaters, THE MONOGRAM COWBOY COLLECTION Volume One. Drawing from a stable of later era Monogram matinees, this set pairs up singing cowboy Jimmy Wakely and legendary action hombre Johnny Mack Brown (the only fella tough enough to play Johnny Mack Brown was himself!) in a double quartet of cordite and cow classics. And to put the cherry in your Sarsaparilla we’ve also included Rod Cameron’s CineColor, “bigger budget” Monogram adventure CAVALRY SCOUT!